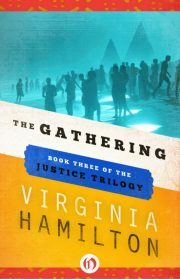 1981’s The Gathering is the third book in Virginia Hamilton’s Justice Trilogy. Justice, Levi, Thomas, and Dorian each have their own special power. Apart, they are impressive (even if some of them do not think so), but together they can step through time itself. That’s good, because they have unfinished business in the future. 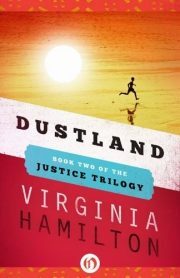 1980’s Dustland is the second book in Virginia Hamilton’s Justice Trilogy. Tom, Levi and Dorian’s psionic abilities are impressive but it took Justice to weld them together into the Unit, able to span time and space at will. There are limits.Although they can project their minds out of their home space-time, the Unit aways manifests in the same distant location. And what an odd location it is. I am continually surprised at the depth and width of my ignorance. 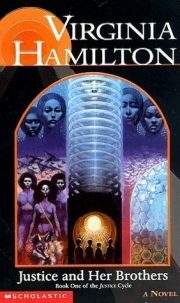 Case in point: Virginia Hamilton, an award winning author who was previously unknown to me. I got to be one of yesterday’s lucky ten thousand; now you can be too . Like most adolescents, Justice Douglass—“Tice” to her parents and friends, “Pickle” to her brothers Thomas and Levi—has to deal with change. In particular, Justice finds herself resenting her mother’s late-blooming college career. Each hour her mother invests in schoolwork is an hour less for Justice and her brothers. It eventually becomes clear that Justice is worrying about the wrong thing. She should be paying more attention to her twin brothers. Thomas and Levi are mirror twins. They may look alike, but one is right handed, one left, one is a leader, one a follower, one is a victim and one … one is a monster….